Hans van Kroonenburg a.k.a Skoulaman, started experimenting with electronic music in the late 70's after encountering the music from artists like Vangelis, TD, JMJ, Kraftwerk and many others. Being fascinated by the music, and as a curious person Skoulaman wondered how all these sounds were created and soon bought his first keyboard, a Solina electronic organ, to find out. Slowly more synthesizers and effects were added to the collection, which until today fill up his cozy home studio. This being the first Skoulaman album that's being released under the Groove label, makes it a special occasion. Also the recording process was a bit more special than usually. Where normally a track would be created completely spontaneous during the moment of recording, this time a more structured approach was needed to be able to reproduce the songs during live performances. The fact that Skoulaman plays his songs completely live without backing track or computer, made it even more challenging. On all the tracks the arpeggiator of the Moog Little Phatty was used as a base sequencing pattern. On some songs sounds recorded in nature were added to the intro (birds from a forest in Boschoord Netherlands / Evening atmosphere Monopoly Italy / and streaming water in Wilnis, the town where I live). As always reverbs and echoes play a big part in Skoulamans sounds. On 2 tracks Skoulamans son, Rik van Kroonenburg plays electric guitar to beef up the sound. 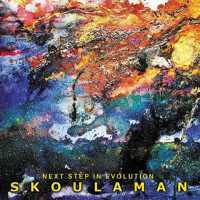 The title 'Next steps in evolution' is chosen because of the constant evolution of Skoulamans music. Creating an album under the Groove Label creates a great step in this evolution. All the audio signals of the equipment were sent to a Spirit Folio Rack Pack and recorded live, each track of the album, in one stereo track with a Tascam DP006 digital recorder. After recording the track was premastered with Ableton Live 8 and mastered at Dreamscape studio. The sigh saddening from a very Vangelis synth awakens a dreamlike introduction by drifting lazily between the twinkling prisms and chords which hesitate between a melodic avenue or a cosmic wandering. The delicacy in the deposit of the keyboard keys is faithful to the signature of the one who was a beautiful revelation in 2014 with Dreaming of the Future Reflecting the Past. The approach is closer to stars with this sensation of weightlessness which moderates this bed of noisy stuffs which nibble at our ears, whereas the sequencer weaves a rhythmic pattern which goes and comes, playing cat and mouse with our hearing, with an elastic effect in its upward influence. The tone is shown to "Colored Glass" because “Next Step in Evolution” leans on these movements of slow sequencing pattern, sometimes they turn more fluid, which serve the cause to these structures of ambiences and of harmonies built on the basis of improvisations. Another line of s e quence congeals its more crystal clear balls which swirl in a motionless envelope, giving this freedom to Rik van Kroonenburg's guitar to throw of riffs and solos, in simultaneous with the synth, which travel through the seraphic mists and other effects of a synth which anchor the music of Hans Van Kroonenburg, aka Skoulaman, in a galaxy not too much far from that of Gert Emmens. With its sequences a little bit foggy, originator of seraphic rhythms, the music of Skoulaman has really took off with its last album, Andros Awakenings. “Next Step in Evolution” follows this tangent with a scenic organization which flirts with this approach of live on a base of improvisation which condemns not at all his vision of sound poetry of which the wide specter of brilliance inhales the soft musing of Vangelis. Like in this introduction of "Foreign Woods" where the keyboard lays down a lunar lullaby strummed with this sensation of small knocks from a metallic hammer on a glass xylophone. The debit varies as the jets of mists. The rhythm which comes from the point of 5 minutes of the of this cosmic musing reminds that of Software, the orchestrations of mist too, in the years 85-88. The sequences swirl as carousels illuminated with hundred lights in a structure which wanders between these phosphorescent lines and these lines of celestial voices which accentuate the depth of the fog effects. "EC2" follows with samplings of alive nature where the chants of birds are cooing on the bright reflections of a water very alive in its bed of rockery. Tearful synth layers are falling and they spread reverberating shadow, sculpting a fascinating funeral ode. It's mostly here that we feel this live vibe of this album. Rarely, an artist will have been so close to my ears! The residues of this elegy is floating and forms some fuzzy sound hoops which get in a jerky trance. This is how a first phase of rhythm gets born in "EC2" Always very soft and poetic, Hans Van Kroonenburg lays here som e melodious chords of which the tinkling roam through a sneaky shadow which took the place of those hoops and restructures the rhythm under the aegis of a synth and of its apocalyptic lines. Fat and juicy sequences get in, amplifying the rhythmic genesis which becomes like the steps of a big clumsy giant running to the left and to the right of our ears. More bright arpeggios add the harmonious touch to this track which in the end crumbles very well its 12 minutes. This structure of sequences rolls the rhythm a little slower in "Rumble" of which the illusion that it wins in velocity is simply superb. The rumbling results from the multi-lines of synths the of which violence are dropping layers of voices as much celestial as the orchestrations without forgetting those vampiric harmonious licks and melodious solos. This is a great track made on the model of Berlin School! The introduction is short for "Ocean and Air Guitar". After the samplings of waves dying on shores, this movement o f sequences which rises and comes down without really conviction turns to rock this hypnotic rhythm which makes the link between the structures of “Next Step in Evolution”. An ideal structure to also put down an atmosphere of the most ethereal, giving a chance to Rik van Kroonenburg to spread his solos, sometimes furious and sometimes anesthetic, of which the answers of his father are translated by more aerial soloes and banks of mist where sing one thousand stars. Once again, this is very nice! Taking advantage of its 18 minutes to structure well its opening and the morphology of its rhythmic evolutionary structure, "Colored Glass Alternate" is an alternate vision of the first title without the presence of Skoulaman's son on guitar. The synth solos are replacing the laments of the six-strings and thin lines of additional sequences, as well as very nice percussive effects, add a charming depth to a more lively, a more fluid structure of this version which enchants me much more than " Colored Glass". Once again, I spent some very good time with the music of Skoulaman. Easy to tame and without a detour towards a form of complexity, the music of “Next Step in Evolution” is beautiful and finds its way easily between our ears and to the bottom of our eardrums. We dream easily on it and we get surprised to appreciate its lightness so much the musical and harmonious aspect is important in the sound ship of Skoulaman. We cannot like it, as much as we cannot shout to genius! It flows and coos between the ears, like a nice evening of sonic poetry.